Microsoft will hold its annual Developer Conference in San Francisco starting April 29th. 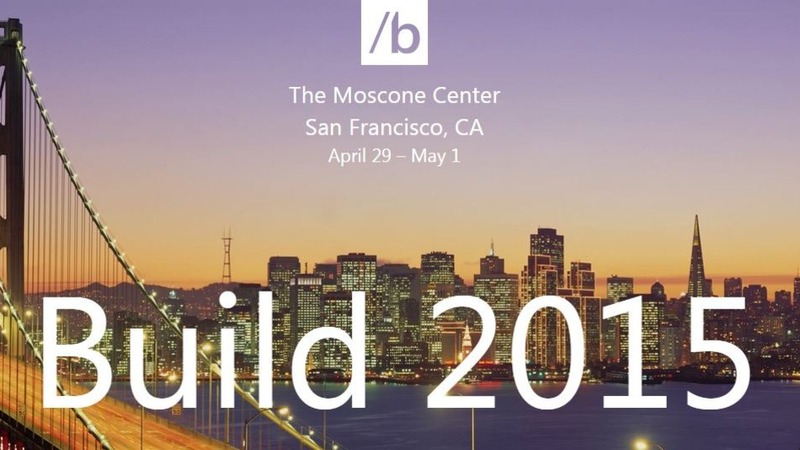 Microsoft is scheduled to hold its annual Developer Conference, Build, later on today in San Francisco, California. This conference will be Microsoft’s direct pitch to the cadres of developers worldwide that create applications and software on Redmond’s various platforms. To put it plainly, these are folks that need to believe in the Windows 10 strategy for it to be come successful. As we covered earlier in our previous Windows 10 articles, Microsoft’s strategy is to have one unified OS across all form factors: from Internet of Things (IOT) sensors, to mobile devices (phones and tablets), PCS (laptops and desktops), Xbox and even Microsoft’s new augmented reality headgear, Holo lens. The theory behind this strategy is threefold. Leverage the scale of devices that currently use Windows (over a billion world wide) to provide a platform where developers can write once and deploy across multiple form factors using one SDK and Visual Studio as the sole IDE (integrated developer environment). These applications can then be monetized through one store (not a separate store for each form factor as exists today). Provide a consistent and tailored UX (User Experience) across all devices, thereby increasing customer satisfaction. This UX will incorporate natural user interfaces as touch, active pen input and more. Use the cloud as the backbone of the OS to make it more agile and responsive in resolving issues but also in deploying new features. Windows 10 will run on all from factors from IOT sensors to the Holo Lens. When will Windows 10 be made available to the general public? The current state of Windows 10 builds shows that there’s still a lot of work remaining, which will put Microsoft planned release date of end of summer in jeopardy. We will also be looking for Microsoft to provide clarity on their plans to make a free upgrade for Windows 7 and Windows 8. What are Microsoft’s plans to bring top tier apps to the Windows Platform? This particular question (in my opinion) has the potential to either make or break Windows 10 even before it has left the starting blocks. With many rumors floating around the Microsoft tech circles on Redmond’s plan to bring Android apps to its mobile devices (which has not helped any other platform that has tried it Blackberry to name a few), such a contentious decision may leave developers wondering why they should invest time and effort on a platform that undermines their contributions. From the consumer standpoint, this will fill the short term gap of apps, but long term it erodes innovation and developer loyalty. It is no secret that Microsoft’s mobile platform has been struggling to grow its market share since inception in 2010. Thus a decision like bring Android apps could have serious and non-reversible ramifications for a platform already in dire straits. What are Microsoft’s plan in executing their Windows 10 strategy? The debacle of Windows 8 shows that no matter how well meaning a software company may be, releasing products that your customers don’t believe in will result in mass mutiny. Windows 10 is off to a good start with the Windows Insider program that collates feedback from a two million plus enthusiast community using the Windows 10 Technical Preview builds. However, if Microsoft cannot convince the hundreds of millions of Windows users who are on Windows 7 and Windows XP that there is value in upgrading to Windows 10, then all their work will be for naught. You can follow the live stream of the 2015 edition of Microsoft’s Build conference here. The Conference will start on April 29th (today) at 6:30pm East African Time. Techweez will have coverage of the Build conference over Thursday and Friday with comprehensive posts. For further information on Windows 10, read our extensive articles by visiting this link.